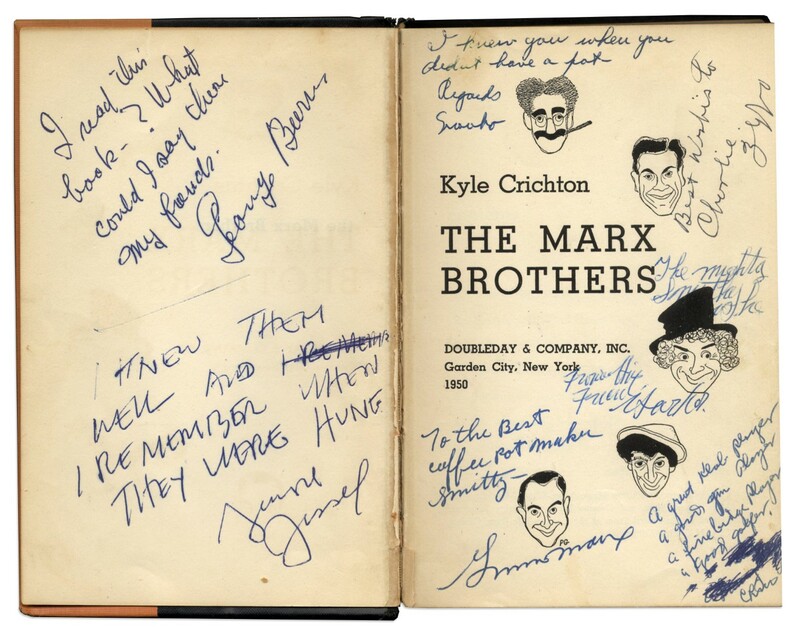 "The Marx Brothers" book, signed by all five brothers: Groucho, Harpo, Chico, Gummo and Zeppo, along with a letter signed by Harpo Marx with a self-portrait sketch, recognizable as Harpo by his mound of curly hair and playing the harp. 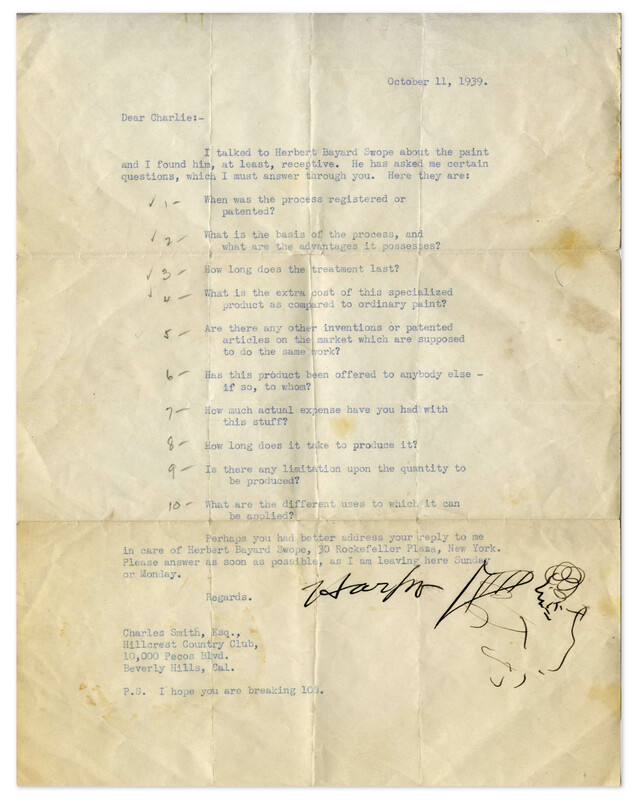 The letter and inscriptions are all to Charles Smith, likely the Marx Brothers' lawyer, based on content of the Harpo letter. Signed upon the title page, the comedians poke fun at "Charlie", writing, "To the Best coffee pot maker Smitty - Gummo Marx"; "I knew you when you didn't have a pot - Regards / Groucho"; "Best wishes to Charlie / Zeppo"; "The mighty Smitty [?] / From His Friend / Harpo"; "A great [?] player / A good gin player / A fine bridge player / A good golfer / [scribbled out] / Chico". 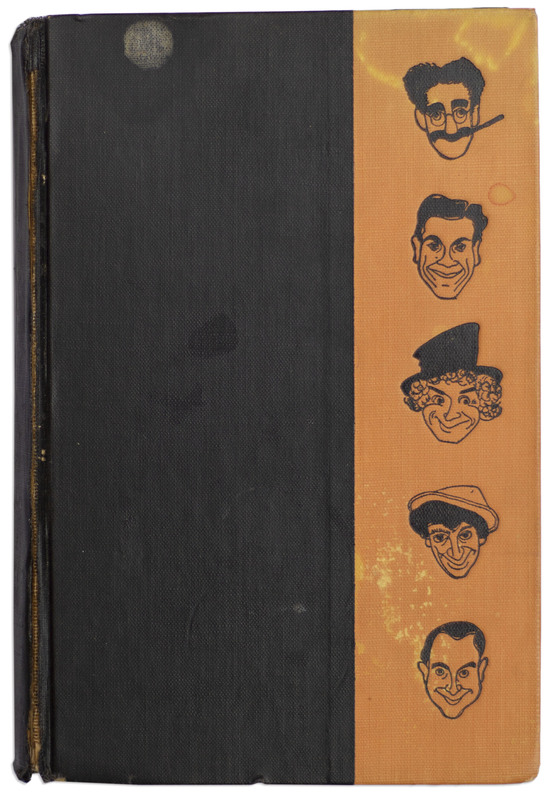 Book is additionally signed on the opposite page by comedians George Burns who writes, "I read this book - ? What could I say there [sic] my friends. / George Burns" and George Jessel who writes, "I knew them well and I remember when they were hung / George Jessel". "The Marx Brothers" by Kyle Crichton was published in Garden City, New York: Doubleday & Co., Inc., 1950, stated first edition. A few spots to boards, with hinges starting to separate, otherwise very good. Lot is accompanied by a typed letter signed by Harpo Marx, dated 11 October 1939 in which he writes to Charles Smith about an apparent business opportunity for a new type of paint. Signed boldly in black ink, "Harpo" with a self-portrait sketch of his Marx Brothers character playing the harp. Letter measures 8.5" x 11". Light toning and folds, with small separation along one fold; overall very good condition. 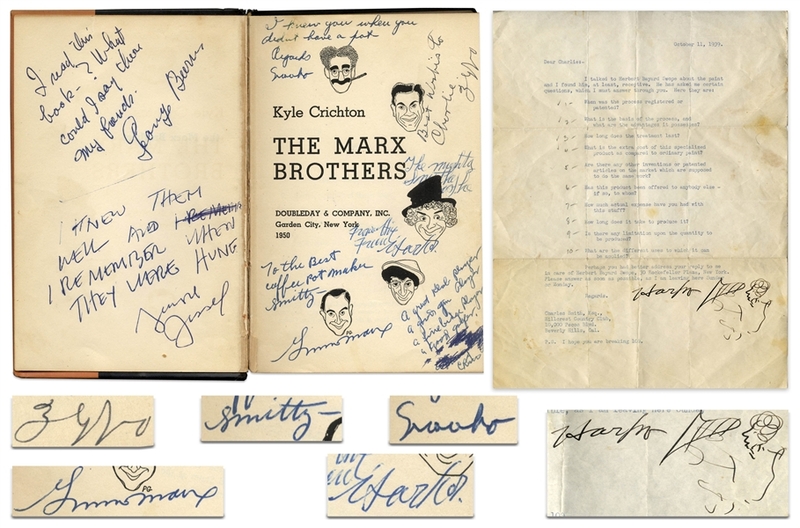 A rare Marx Brothers lot, unusually signed by all five.